Explain skirt boards and skirting? May 9, 2017, 7:51 p.m. Skirt board - used on side of conveyor to keep material from falling off the side. 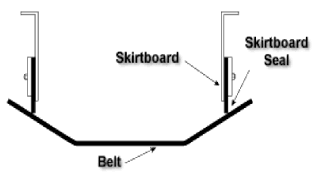 Skirting (skirt board seal) - attached to skirt board to come in contact with belt. May 9, 2017, 8:04 p.m. Which are most common failures of conveyors and their causes?